the events occurring as a result of ionising radiation interacting with matter (this results in free radical formation and the area of free radical chemistry is large). The photon that traverses the cell can interact with the biological molecules, but this is of lesser consequence as all these molecules are derived from blueprints inside the nucleus and can be regenerated. Having said that, the alteration of biological membranes can release ceramide which has effects on the apoptotic cascades. Ceramide is a sphingolipid that acts as a second messenger in ubiquitous, evolutionarily conserved, signaling systems. Emerging data suggest that radiation acts directly on the plasma membrane of several cell types, activating acid sphingomyelinase, which generates ceramide by enzymatic hydrolysis of sphingomyelin. Ceramide then acts as a second messenger in initiating an apoptotic response via the \ mitochondrial system. Radiation-induced DNA damage can also initiate ceramide generation by activation of mitochondrial ceramide synthase and de novo synthesis of ceramide. In some cells and tissues, BAX is activated downstream of ceramide, regulating commitment to the apoptotic process via release of mitochondrial cytochrome c. Genetic and pharmacologic studies in vivo showed that radiation targets the acid sphingomyelinase apoptotic system of microvascular endothelial cells in the lungs, intestines and brain, as well as in oocytes, to initiate the pathogenesis of tissue damage. Regulated ceramide metabolism may produce metabolites, such as sphingosine 1-phosphate, shown to signal antiapoptosis, thus controlling the intensity of the apoptotic response and constituting a mechanism for radiation sensitivity or resistance. An improved understanding of this signaling system may offer new opportunities for the modulation of radiation effects in the treatment of cancer. When the photon traverses the cell nucleus, the interactions with DNA are considered to be quite important because of the fundamental position of DNA and its surveillance in cell health, survival and reproduction. 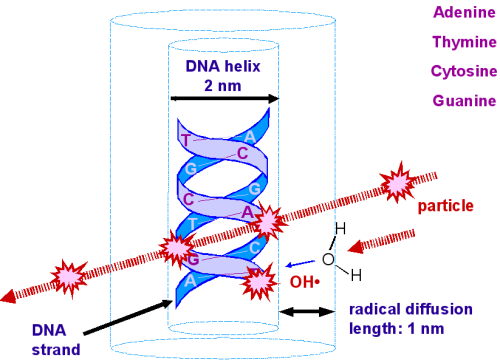 The incoming photon can interact directly with the DNA, and in this the interactions with the base pairs are more important. The sugar-phosphate component is only a backbone that can be reconstituted easily - SO LONG AS ONLY ONE IS BROKEN. DNA repair mechanisms have a very high fidelity, so long as a strand is left intact on which to build the replacement strand. So ionising events that affect a single strand are unlikely to prove fatal, unless the repair is prevented, or there is another unfortunate stochastic event occuring before the damage is fixed. This is to say that a double single strand breaks if co-located will have the same effect as a single double strand break. The bases are a different matter. Free radical formation of a base can result in altered bases with altered bonding and covalent linkage with opposed bases. The damage does not have to be to a base. Almost all biological materials can be made into free radicals, but the most prolific and movable is water. The ionisation event in water produces a free radical called the hydroxyl radical OH. which is particularly reactive and can diffuse a short distance.